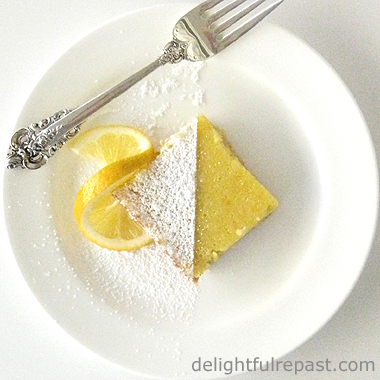 This was my Southern grandmother's basic Little Yellow Cake when she wasn't getting fancy with a layer cake. 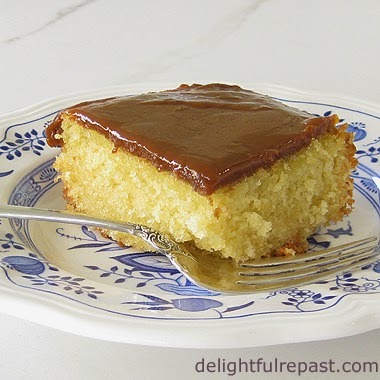 The "little black dress" of cakes, it can be accessorized lots of ways, and she had four toppings she used for it at various times: caramel icing, chocolate icing, broiled coconut or streusel. My husband prefers the chocolate icing, but I just had to have caramel. Some cooks shy away from making caramel because it's one of those things with a bit of a mystique about it. But, truly, it is so easy. Sometimes I start with regular granulated sugar, but this one is made with dark brown sugar and couldn't be easier. The cake is a tender yellow cake that starts with the butter being cut, or rubbed, into the flour mixture as if making biscuits. Grandma was constantly making biscuits, so she always had buttermilk on hand. I don't always have it, so I just use milk soured with cider vinegar, as shown below. 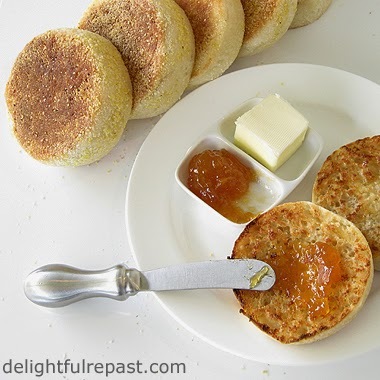 This got me thinking about Grandma's kitchen (especially since I just wrote about My Kitchen). She had a tiny, and I mean teeny tiny, kitchen that was always neat as a pin. Never a dish in the sink or anything left on the counter. Her kitchen equipment was so limited, she would be goggle-eyed with wonderment to step into my kitchen. And yet her cooking was not limited. Go figure. 1 Preheat oven to 350F/180C/Gas4. Grease well and lightly flour one 9-inch round or 8-inch square pan; you can skip the flour if you're going to serve it directly from the pan as I did this time. Measure vinegar into 1-cup glass measure; add enough milk to make 1 cup. Stir and let stand about 5 minutes while you proceed. 2 In mixing bowl, whisk together flour, cornstarch, sugar, baking powder, baking soda and salt. Cut in the butter as if making biscuits. Add soured milk, eggs and vanilla. With electric mixer, mix on low speed for 30 seconds to combine, then on medium speed for 1 minute. 3 Pour into prepared pan. 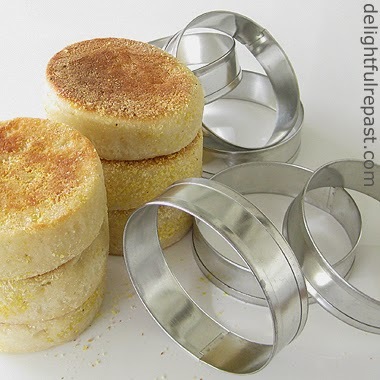 Bake for 30 to 40 minutes, or until golden and a toothpick inserted in the center comes out clean. 4 Cool in pan on wire rack for 10 minutes. Remove from pan and cool on rack for an hour. Grandma usually just served this cake directly from the pan, and that's what I did here. 5 After the cake has been cooling for 45 minutes, put the cream, sugar and salt in a heavy-bottomed 1.5-quart saucepan and bring the mixture to the boil, stirring until sugar is dissolved. Then boil without stirring until the caramel registers about 232F/111C to 240F/115C on an instant-read* thermometer, about 10 to 12 minutes. * You could use a candy thermometer that clips to the pan, but since I'm not a candy fan I don't have one of those. I use my Thermapen for everything! 6 Remove from heat, stir in vanilla and beat vigorously with a wooden spoon until smooth. 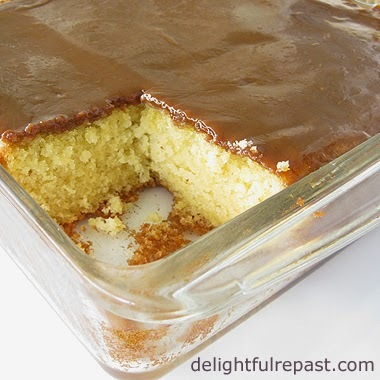 Pour onto cake and immediately spread it to cover cake; the caramel sets up very quickly. It's funny, I can't make decent hash browns to save my life; but call them Pomme Rosti, and I have no problem! Does that make me a potato snob? I don't use nonstick skillets, and I've always had trouble with hash browns or country-fried potatoes sticking to the pan. 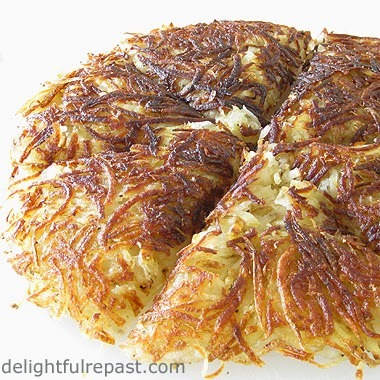 So when it was time to slide the pomme rosti out of the pan and turn it over, I was very pleasantly surprised (actually, I was shocked) when it slid right out of my stainless steel fry pan without the slightest bit of problem! Whatever you want to call the recipe, you need starchy potatoes, like russets or Yukon golds, not waxy potatoes. 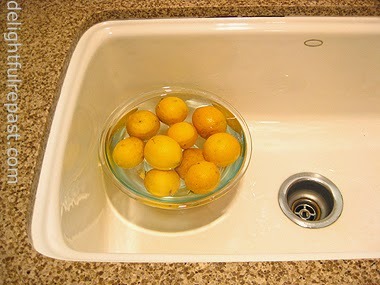 And yet, after the potatoes are shredded, you will be rinsing away as much starch as you can. Go figure. Anyway ... just 20 minutes in the pan and these potatoes are crunchy and brown on the outside, creamy and tender on the inside. And they're not just for breakfast. They are dinner party worthy. Aren't potatoes the best? (Especially mashed potatoes. Oh and potato salad.) What's your favorite kind of potatoes? 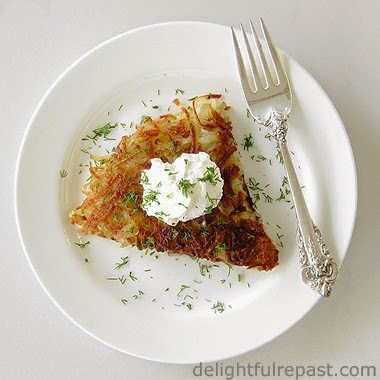 Have you ever made pomme rosti? 1 Put shredded potatoes (I used the Cuisinart food processor to shred in just a few seconds) into a 2.5-quart bowl of ice water and swish them around. Drain them in your hands as you pull them out by handfuls, spread them on "an impeccably clean towel' (as Julia Child would say), roll up the towel and give it a good squeeze. 2 Preheat 12-inch slope-sided skillet over medium-high heat. Dry the bowl thoroughly and return the shredded potatoes to it. Pour on the melted butter, salt and pepper; mix well. 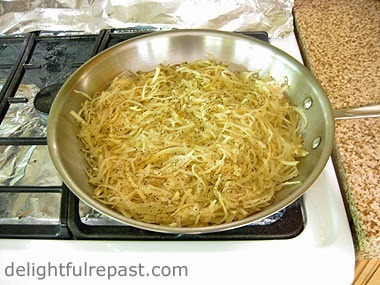 Transfer potatoes to preheated skillet, pressing them down as much as you can. In case you're wondering about the foil behind the pan, I put a 30x18-inch piece of heavy-duty foil over the back of the stove whenever I'm frying so I don't get the stove all greasy. But, no, I don't use a new piece of foil every time; I reuse it many times and then recycle it. 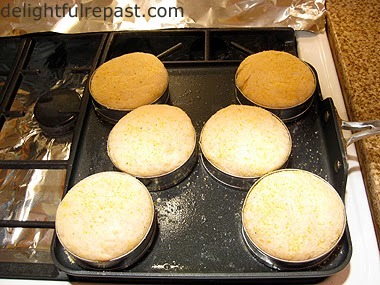 3 Cook over medium-high heat until golden brown, about 10 to 12 minutes. Slide them onto a plate. * Carefully place the skillet upside down over the potatoes and then flip the whole thing over and cook the other side until golden brown, about 10 to 12 minutes. 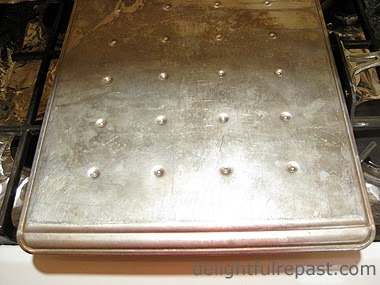 * I used the All-Clad Stainless 12-Inch Fry Pan to cook the potatoes and slid them onto its lid to turn the potatoes. The lid handle stuck down through the grate so it was steady as I slid the potato "pancake" onto it. Then I set the pan upside down over the potatoes and used potholders to flip the whole thing over. Worked like a charm! Note: If making this up to an hour ahead, preheat oven to 200F/93C. 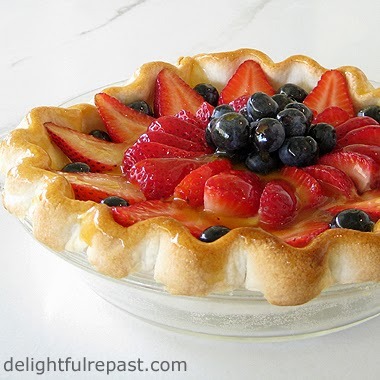 Leave it whole and place on a wire rack set inside a rimmed baking sheet in preheated oven. When ready to serve, proceed with Step 4. And eat it all; it really loses something when reheated the next day or even just hours later. British newspaper The Guardian recently started a Kitchen Encounters: My Kitchen series, in which the interviewees (people in food -- sorry if that sounds unwieldy, I refuse to say "foodies") respond to the same 10 questions. I'm probably correct in assuming that they won't be contacting me for an interview any time soon, so I thought I'd just interview myself! Besides, I've had an extremely busy week or so working on freelance projects with clients and haven't had much time or energy left to cook for myself and my blog, so this is a perfect way to post this week. I hope you'll leave a comment and tell me a little something about your kitchen or anything else you have on your mind. My kitchen is ... U-shaped, not especially large but what I call "maximized" since I remodeled it eight years ago, with quite a lot of countertop (quartz) and efficient storage. The walls are pale butter yellow because that is simply a must for me; I've had a yellow kitchen nearly all of my adult life. Another must is a big, deep, single-bowl cast-iron sink (and no waste disposal unit, called a garbage disposal in the US). My favourite (British spelling, not typo) kitchen tool is ... a Danish dough whisk, the utensil in my header (see it there between "Delightful" and "Repast"?). Since I'm a breadaholic and constantly making yeast dough, it's something that gets a lot of play in my kitchen. You'll find more here at 10 Favorite Kitchen Gadgets and 10 Favorite Kitchen Essentials. My storecupboard staple is ... organic unbleached all-purpose (in the UK, plain) flour. I panic when my flour bin is down by a quarter and I don't have a spare bag on hand. Though I also have a huge stash of other flours (whole wheat and all the gluten-frees) in my freezer, I never buy bread flour or cake flour and like to say I can make anything with my unbleached all-purpose. When I'm starving I ... head for my Number Two storecupboard staple: 16-ounce cans of organic refried pinto beans. I usually cook dried beans, but if I need a quick hit of protein I just heat up half a can of beans and shred a little cheese on top, and my day is saved. 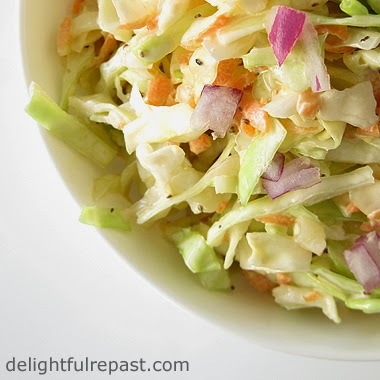 I eat this only when alone; my husband thinks it is disgusting! My culinary inspiration is ... my heritage. My Southern (US) paternal grandmother and my English maternal grandmother. And my mother who was an inspired cook with "perfect pitch," able to taste any sort of dish and recreate it. I learned a lot from them and I have lots of my mother's things in my kitchen, so I'm always sort of communing with them in the kitchen. 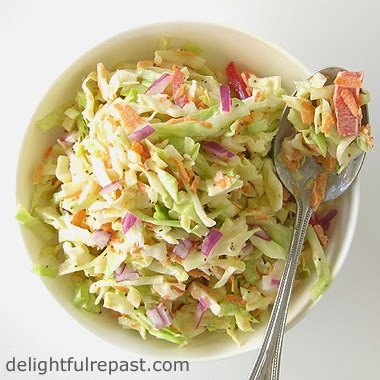 My best-kept kitchen secret is ... I have no kitchen secrets. I'm always happy to tell my readers and friends (and even total strangers standing by the produce looking lost) anything I know about food. 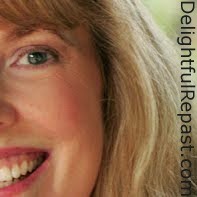 My best-kept secret of all is my blog. Almost none of my friends and relatives even know I have a blog. My current obsession is ... sourdough. I make all kinds of bread and bread-y things, but it had been several years since I had made sourdough. Then several months ago I decided to start another sourdough starter, and I'm constantly making sourdough breads and bread-y things. And, of course, anyone who has been reading my blog for any length of time knows of my lifelong obsession with tea (the beverage and the occasion). Everything tastes better with ... bread. No, just kidding. Everything, well, many things taste better with lots of coarsely ground black pepper. I don't like the powdery stuff, but I no longer bother with pepper mills. My pepper snobbery is limited to insisting on coarsely ground. I buy it in 4-ounce jars and use it up quickly enough that it doesn't lose its "freshlygroundness." When I go shopping I ... use a list and don't use a list simultaneously. I go down every single aisle of the store, picking up things from my list and from my head. If something looks especially good or is an exceptionally good deal, I change my meal plans on the spot. And I never shop for more than a few days at a time. I find a lot less food goes to waste that way than if I try to shop for the entire week. For dinner tonight ... I'm pulling a homemade meal out of the freezer. It's been an extremely busy food week, so I'm glad I always have something homemade (like Golumpkis or Sheet-Pan Tamales) in the freezer for days like this.